In the 20 years I have published Chargerblue.com I have had the privilege of watching and sharing the exploits of some amazing Hillsdale College Football players. As I have looked back over the past 20 seasons, tons of great names have come rushing back. I asked readers on Twitter and on the Chargerblue Facebook page who their top 10 are and it was great to read names like OL Phil Doerfler, QB Bill Skelton, and both Gurica brothers…guys who were great players in their times. What was consistent was the love so many former players have for their Charger brothers, as their nominees were all teammates. One suggestion was to pick 8 starters from the 2009 that advanced to the 2nd round of the D2 playoffs and then add two more. That would have made a great list…but not quite this one. The process took a lot of research and trips back in the blog archives as well as what seemed like constant reshuffling. What’s really amazing is that I had to leave so many All-Americans off of this list. So without any further ado, here it goes. 10. Nick Hixson DB/WR: The former member of the New Orleans Saints and the Carolina Panthers practice squads was a huge part of the Chargers’ playoff bids in 2009 and 2010. Hixson led the Chargers in tackles in 2010 with 92 stops and had 3 interceptions. Hixson’s pure athleticism would show itself in 2011 when he would become not only one of the GLIAC’s best lock-down corners but also one of the nation’s best third down receivers. Every time the Chargers successfully completed a pass for a third down conversion, it went to Nick Hixson. Hixson finished that season as the Chargers’ #3 receiver along with 62 tackles and All-American honors. 9. Ed House WR: The 6-4 180 Toledo St. Francis product was Hillsdale’s all-time leading receiver for a decade from 2001 to 2010. House was the first true playmaker at receiver for Hillsdale in generations with an ability to take over games and win jump balls with his lanky frame. One of the best examples of this was his 222 yard explosion against Grand Valley in 2001 where House would account for 67% of Hillsdale’s total offensive output that day (332 total yards). The other came 2 seasons earlier as a sophomore when he helped lead Hillsdale to a thrilling 40-37 upset over national contender Ferris State. His 34 yard touchdown catch might be one of the prettiest plays this guy ever witnessed at Muddy Waters Stadium. 8. Trey Brock WR: Before his career is over, Brock will most likely move up this list. He’s had an incredible three year start to his career and is poised to do major damage to the Charger record books. Like everyone else on this list, Brock has transformative talent. He’s got the ability to score from anywhere on the field at any moment. As a sophomore in 2016 Brock fell less than 100 yards shy of the single-season receiving record and despite drawing a season of the opposition’s best corners and tons of double coverage this year, Brock made another run at that record in 2017. We will have to see when it is all said and done where Trey Brock finishes among the all-time greats at Hillsdale College. One thing is certain. We are all very fortunate to get to enjoy one more great season of watching Brock in 2018. 7. Tim Mustapha DB/Punt Returner: It’s been sixteen years since Tim Mustapha played his last down at Hillsdale College but he still sits atop the GLIAC record book in three categories. The three-time All-GLIAC and 2000 GLIAC Defensive Back of the Year and All-American still holds the record for most interceptions in a game with 4 against Wayne State on October 14, 2000. That year Mustapha would pick off 11 passes which is still the most ever in the GLIAC. His 18 picks he totaled from 1998 to 2000 is also the GLIAC record for most interceptions in a career. Not only was Mustapha one of the most dominating defensive backs ever to wear Charger blue, he was also a deadly punt returner who totaled 1,242 and multiple touchdowns for the Chargers. Tom Korte lays out a Ferris State quarterback. 6. Tom Korte LB: No defensive player in the last 20 years was more physical than Tom Korte. Solidifying himself among Hillsdale’s historic lineage of great linebackers, Korte brought a hard-nosed attitude to the Charger defense that was infectious to his teammates…even as a true freshman playing in one of the best Division II conferences in the nation. Then Hillsdale Daily News sports editor RJ Walters described Korte as ” one of the most intelligent, game-changing defensive players I’ve ever witnessed at the D-II level”. 2007 was a watershed year for a program trying to recapture its historic winning tradition. Hillsdale’s offense would grab a lot of headlines but the Charger defense led by Tom Korte would play just as big of a role in the team’s 8-3 record and near miss at its first ever Division II playoff bid. That year Korte would finish 2nd in the GLIAC with 134 tackles. The 2006 and 2008 team MVP would join the Pittsburgh Steelers for training camp as an undrafted free agent in the Fall of 2009 and had an impressive camp including an interception in a preseason game against the Washington Redskins. The D2football.com honorable mention All-American would make it to the final cut but was let go on the final day of camp. Throughout Korte’s career D2football.com’s Tony Nicolette would call Tom the “gold standard of GLIAC linebackers”. 5. 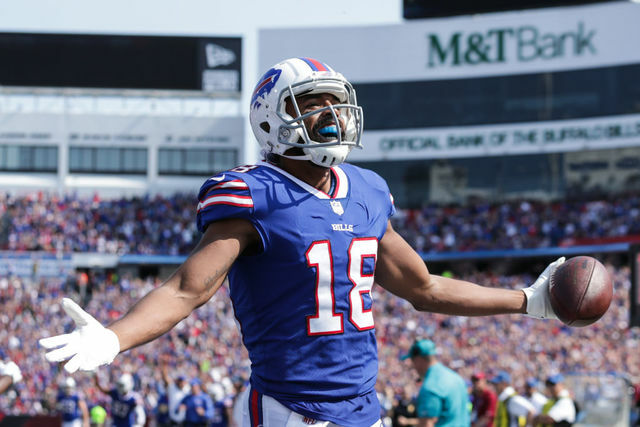 Andre Holmes WR: Hillsdale’s all-time leading receiver Andre Holmes was an essential part of Hillsdale’s back-to-back Division II playoff appearances in 2009 and 2010 and would go on to be integral parts of both the Oakland Raiders (top receiver in 2014) and now the Buffalo Bills. With a 6-4 frame and the raw athleticism that helped him win the GLIAC Triple Jump title in 2006 there weren’t many D2 defensive backs who could effectively take Holmes away as a huge offensive threat. Besides just athleticism, Andre Holmes demonstrated great perseverance as he would have to wait a couple of years behind a log jam of great Hillsdale receivers but exploded for over 1000 yards in 2009. When Wayne State came to town that year it was supposed to be the eventual Harlon Hill Trophy winner Joique Bell’s show. Holmes quickly changed that narrative with 3 TD catches on Hillsdale’s first 3 possessions including a 68 yarder that put the Chargers up 21-0 three minutes into the 2nd quarter. Holmes would only get better. 2010 not only would the best year of his Hillsdale career, it would be the best year ever by any Hillsdale receiver. In six games Holmes hauled in 9 or more passes and his 16 against St. Cloud St. in the D2 playoffs is the most ever in a game by a Hillsdale receiver. His 1368 yards in 2010 is what every Charger receiver chases annually, the single-season Hillsdale record. Well, it wasn’t really magic at all. Having grown up in Indianapolis, Nicolet had some unique connections to the defending World Champion Indianapolis Colts and Hall of Fame coach Tony Dungy. During the summer of 2007 Mark would spend time at the Colts facility, even throwing at times with Peyton Manning. The Charger coaching staff would also spend time that summer with the Colts as former Hillsdale lineman Howard Mudd was a member of Dungy’s staff. With Nicolet in the middle of it all Hillsdale rebuilt itself offensively into a team that would take not only the GLIAC but Division II by storm. After posting 101 points in its first two games Nicolet would set single-game Hillsdale passing records for completions (204) and passing yards (426) in a Week Three 49-28 annihilation of then #25 Ashland. It had taken the 2006 Chargers 7 games to score as many points as the 2007 team had done in 3 weeks. That year Hillsdale would end the seven year skid of losing seasons, finishing 8-3 and just outside of the D2 playoffs. Nicolet would set a Hillsdale single-season record of 3,335 yards and a GLIAC record of 3145 yards in conference games. The latter still stands today as does his Hillsdale record of 31 passing TDs in a season. He would be the GLIAC Player of the Year and a regional finalist for the Harlon Hill, becoming the first Charger in 15 years to earn those honors. More than anything Mark Nicolet restored faith in Hillsdale College Football that season by creating a momentum that would propel Hillsdale to some of its biggest accomplishments in years. Although he would be long gone from the Hillsdale campus, the examples Nicolet set of perseverance, incredible work ethic, and total class would be carried on by the back-to-back playoff teams in 2009 and 2010, as well as the 2011 GLIAC champions. Mark Nicolet also attracted the first NFL scouts to visit Hillsdale in years. Not only would those visits garner the QB a tryout with the Detroit Lions, they would lead to the discovery of players like Jared Veldheer, Tom Korte, and the many other Chargers who have gotten shots at professional football. 3. Joe Glendening RB: “Joe The Show” is a moniker that has followed the ever-so-humble running back since his days of elementary school football in East Grand Rapids. For three years as Hillsdale’s feature back, Joe was the show and more. Glendening came in as the Michigan high school football Gatorade Player of the Year and one of the most celebrated recruits in Hillsdale history. He did not disappoint. Joe Glendening holds every rushing record at Hillsdale College and his 2010, 2011, and 2012 totals are 3 of the top 5 rushing seasons ever posted. His 1604 yard showing in 2011 not only earned him GLIAC Player of the Year honors but also broke Scott Schulte’s 19-year-old single-season Hillsdale record of 1582. A year later Glendening would have another 1500 yard-plus season and overtake Schulte for the career rushing record, finishing his time in Blue and White with 4772 yards. Glendening also holds the top three spots for most carries in a season. His 27 rushing TDs in 2011 broke Nate Clark’s record of 24 that was the oldest record on the books, set back in 1954. Glendening’s 62 total touchdowns for a career is also a Hillsdale record. Not only did Glendening put on a show every time he suited up for the Chargers he demonstrated incredible toughness, battling lower leg injuries and a concussion over the course of his last two seasons. He would not only be recognized as a three time All-American but also a national finalist for the Harlon Hill trophy, leading the nation in points and total touchdowns while finishing 2nd in yards per game at 160.4 yards per game in 2011. Here are 3 minutes and 36 seconds of the magic Joe Glendening brought to Hillsdale College. 2. Troy Weatherhead QB: With big shoes to fill following Mark Nicolet’s historic season, Troy Weatherhead not only kept the show on the road, he took Hillsdale College to new heights. His first season in 2008 wasn’t always pretty but one thing can be said about Weatherhead. He learned from every single experience and rarely made the same mistake twice, getting better and better each year of his career. No one in Hillsdale history has accounted for more yards than Troy Weatherhead. His 9544 passing yards is nearly 2500 more than 2nd place on the all-time list. As a junior Weatherhead would lead Hillsdale to two of the program’s most significant wins, the snapping of Grand Valley’s 40 game winning streak and Hillsdale’s first ever Division II playoff win at Minnesota State. In 2010 Weatherhead would lead Hillsdale to another significant milestone as the Chargers reached the playoffs for a second straight year. That year he not only increased his yards per game production but reduced his interceptions and threw a career high 26 touchdowns en route to being named GLIAC player of the year. Most notably in 2010, Troy Weatherhead would lead all quarterbacks in all divisions with a 76.9 completion percentage. That mark would still today beat the all-time BCS mark of 76.67 set by Colt McCoy in 2008 and is the Division II all-time record. Troy’s 92% completion percentage on October 9, 2010 at Ohio Dominican set a new GLIAC single-game record and his 75% accuracy for a career is also the current D2 record.Weatherhead would play in the Division II all-star Cactus Bowl and spend Fall Camp with the Cleveland Browns as an undrafted free agent. Jared Veldheer snacks on a Findlay Oiler. 1. Jared Veldheer OL: If on their first day of practice at Hillsdale you’d been pressed to pick which member of the 2005 recruiting class would become not only the #1 player on this list but one of the highest drafted players in NCAA Division II history you probably would not have picked Jared Veldheer. In a few short years there would be no mistaking. Veldheer was a nice prospect at 6 foot 7 and 265 pounds but was a long way from the player he became. After a career of constantly getting bigger, faster, stronger, and better, Jared would become the only member of this list in the Hillsdale Athletic Hall of Fame and establish himself as a professional prospect who garnered the same pre-draft attention as players from the big time football schools. Now eight years after he played his last down for the Chargers, his coaches, teammates, and even professors talk as much about how hard Jared worked and the cerebral approach he applied to everything at Hillsdale as much they talk about his play on the field. At 6-8 and 315 pounds Veldheer moved with the grace of an NBA power forward moving in the paint. Sure there was freakish athletic ability, but there was also meticulous attention to the details of timing and footwork. Many times the first player on the field hours before game time would be Jared. Coming from a predominantly run-oriented offense in high school, Veldheer spent a ton of his time at Hillsdale not only learning proper technique but perfecting it to an elite level. Veldheer would start every game from 2006 to 2009 and would not surrender a sack his entire career. What started as solid play and consistent protection evolved into being a true mauler at the position and arguably the most dominant lineman in the nation. Chosen as a captain for three years, he was the consummate leader by example at Hillsdale College. That continues today as the NFL veteran is regarded by his Arizona Cardinal teammates as one of the franchise’s best locker room guys and true professionals. When Jared Veldheer was drafted in the 3rd round of the 2010 draft by the Oakland Raiders, NFL Network pundits declared him a project who likely wouldn’t see the field much in his first couple of years. Well, Veldheer not only proved the analysts wrong but showed the NFL just how good he really was by winning a starting job in his first training camp. Jared was named to the NFL all-rookie team that year and has established himself in the upper echelon of NFL linemen, being a prized free-agent signing of the Cardinals in 2014. It has been a joy over these past 20 years to tell the stories of all of these great players. It’s been an even bigger joy to discover what an amazing person each member of this list is as well. Chargerblue.com has been a labor of love and these guys are why.